Background – this came about from residents’ concern about reckless speeding; working with the FCPD and county to study traffic issues, trends. Currently Braeburn, Ashmeade, El James – all have speed humps. The traffic calming committee has been putting in for new traffic calming tables. Braeburn, Ashmeade, Rockcrest, and Briar Patch qualify for the calming tables based on the number of cars but also based on the average speed. They met with county in the fall – and again in the spring – and looking at the data from the prior years, there hasn’t been much of a difference in speeding based on the presence of the calming tables. Slow Down signs available from John Cookes office – a campaign started and the signs are free to residents. If you have concerns please let Kathy know! Three or Four editions each year, 4‐6 pages; things happening in the neighborhood, she contacts the board members, local school PTA, holiday events, the neighborhood yard sale, pool announcements etc! It usually takes a few days to write and the printer gets it back in a day. She distributes it to the VPs, who distribute to the block captains, who distribute it to us!! Thank you Ann for your fabulous work – it’s greatly appreciated! If YOU are interested please let us know! Median Strip Manager – Thank you Jenny and Chad Raymer for keeping the median strip beautiful for the past 5 years; we need someone willing to keep the plants trimmed, mow the lawn, and just keep it maintained. There is a budget for this – it’s really about your time and interest to keep the entry to our neighborhood beautiful! 3. Welcome sign repair – all this wet weather has really done a number! We could fix it, or replace it but at the very least it needs to be sanded, repainted, and the vinyl letters replaced. Be on the lookout for a message about sign cleanup day! About to open for the season (opens Memorial Day weekend). New online membership system in the works, there’ve been a few snafoos but it’s very efficient and should have membership open mid‐April. You’ll see a blast from email, Facebook, etc. Membership will be online, you can pay online, but you CAN still pay via check. We have NV Pools again this year – we’re excited to welcome them back! iii. BONUS! If you pay your membership by end of April you will be entered into a drawing for $250!! 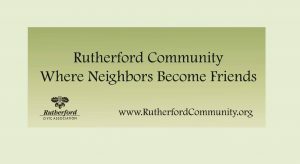 There will also be a pre‐summer season fundraiser: “The Taste of Rutherford” May 24th (the day before pool opens) – open to ALL residents, not just pool members; price TBD. RFD has a wonderful swim team teaching children to swim from age 3‐18, and additionally offers lessons to children not on the swim team. There is a new member open house on May 19th; please contact Bill Blackford, the membership coordinator, with any additional questions! Note: we did not make all of the planned charitable contributions in 2018. The Board has discussed other uses for RCA funds which we believe better support the theme of helping neighbors become friends. We are leaning toward putting more funds towards programs that encourage neighbors to interact (please see the above mentioned MiniGrant Program); I’d also like to propose that we add funding for a spring program (Easter Egg Hunt in RFD Park – and apparently this used to happen a while back) and consider increasing the amounts budgeted for the fall festival and national night out. One more thing to note from the 2018 budget ‐ we have now paid our Braddock District dues. 7. Spring Stroll – date TBD, more info coming soon! 8. Community Yard Sale – May 18th; Allie and Rob Calderon on Briar Patch set out signs and maps if you want to participate. Look for more information on the Yahoo and Facebook groups! 9. REMINDER: If you live in the neighborhood there is a Yahoo group, a Facebook group, and a Next Door group if you would like to join and keep up with all the neighborhood happenings!